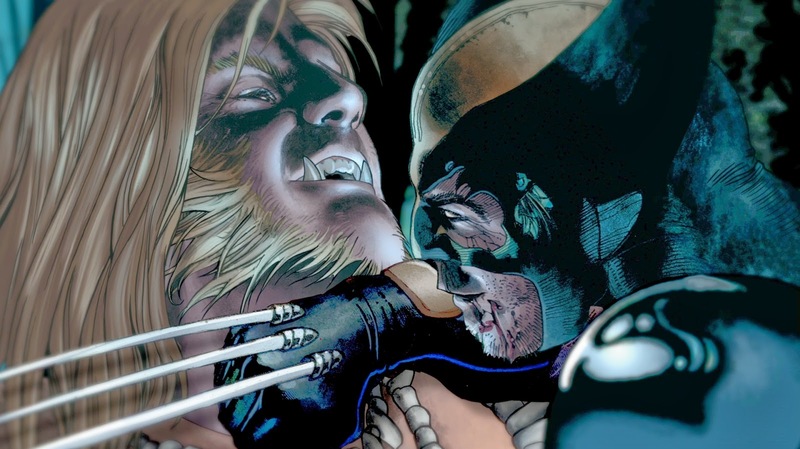 As far as comic book rivalries go, surely none could be more violent and classic than that of Wolverine and Sabretooth. Oh, and by rivalry, I actually mean the unending urge to rip out each others skulls and drink from them like goblets. So no, it's not a traditional rivalry in a Ash Ketchum and Gary Oak sort of way. Well, either that or we watched two very different versions of Pokemon. Anyway, to get back on track, the feud between Wolvie and Sabretooth although iconic, is marred and bogged down in confusing continuity and occasional inconsistency. Wolverine vs Sabretooth from Marvel Knights Animation, based on the comic of the same name by Jeff Loeb and Simone Bianchi, attempts to both simplify their relationship while breathing new life into their never ending conflict. source material so I will be reviewing this motion comic on both its story and static art as well as its motion comic elements and animation. With a title like 'Wolverine vs Sabretooth' you wouldn't be blamed for thinking that this story is merely an excuse to see everyone’s favourite mutant wolf-men tear each other to shreds, but you would be wrong. The first ten minute episode opens with Wolverine having a strange flash back about some sort of werewolf like race known as the lupine. These flashbacks more or less persist throughout the ten episodes and apart from interrupting the flow of the story, don't really acheive much. But what is the story, you ask? Well, I'm really not quite sure. What starts off as a long and drawn out attempt for Wolverine and Sabretooth to kill each other suddenly takes them to Wakanda, then to the Weapon X base, then away from the Weapon X base, then back to the Weapon X base, with plenty of explosions in between. This is all punctuated by plenty of explanations that never quite add up or make sense. Call me ignorant but the big revelations and plot points never hit home and just left me feeling unsatisfied and befuddled. But before I come across completely negative, credit where credit is due. A big kudos to Loeb for attempting to bring clarity to the ever so convoluted rivalry between Wolverine and Sabretooth. Even if it fails miserably and only makes the whole thing even more confusing, you have to admit that Loeb has stones for giving it a go. Plus, the dialogue is entertaining and believable the whole way through. He can certainly write an authentic Wolverine. Simone Bianchi's art, although possibly not best suited to comicbooks, does look stunning and I was surprised by how much I enjoyed it. 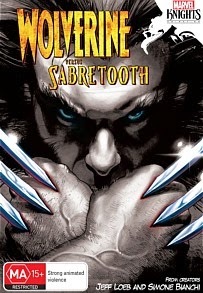 He brings a bizarre beauty and sophistication to the primal struggle between Wolverine and Sabretooth. It doesn't always 'fit' the story but for the most part it works. Unfortunately the motion comic elements add very little to the whole experience. 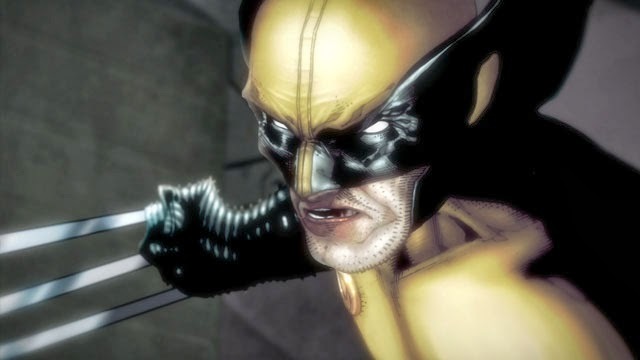 The voice acting is sub par with a lot of the female voice actors playing multiple roles and putting on fake accents whilst Wolverine sounds like Christian Bale's Batman smoked ten packs a day. The animation doesn't fair much better. In the fight sequences characters look like paper dolls, always looking trapped in the second dimension and static. For a story so reliant on fight scenes and action this is a real let down and begs the question as to why they chose to make it into a motion comic instead of properly animating it. It all reeks of a rush job if you ask me. Now we come down to the crunch, the all important question: does 'Marvel Knights Wolverine vs Sabretooth' warrant you trading in your hard earned cash for a copy. The short answer is no. As much as I would love to end this review on a positive note, I just can't. For a Marvel Knights production this really is a step down in quality. It all feels like a rushed grab for money that displays none of the high production values or the eye for detail we have come to expect from Marvel.